Venetia Kelly’s Traveling Show by Frank Delaney is a coming of age novel set during a tumultuous time in Ireland’s history. Set in the early 1930s, Ireland and Britain were in the midst of an economic battle in which farmers refused to keep paying back the loans that enabled them to buy farmland. And Britain consequently began placing tariffs on all Irish goods — all the while the political system in Ireland was tenuous. The narration is conversational in tone as Ben MacCarthy tells his family history, with tales on the side about the political climate of the time. Although he digresses from the main story of his father’s disappearance and reappearance with the Venetia Kelly Traveling Show , MacCarthy warns you ahead of time that he often falls off topic, but that most of his stories have some relevance to the main narration. A quirky technique, but enjoyable given that the digressions are entertaining. Delaney has created a multitude of characters with their own depth and meaning in the story, and there are references throughout to other classic works. He has created an energized menagerie through which readers will see and experience through Ben’s eyes as a young man in search of his father and himself. In many ways Ben is like his father, especially as the narration progresses. Readers will find that he is unwinding his story slowly and deliberately, mirroring how his father contains his emotions and his true passions from his family. The deliberate way in which the story unfolds enables readers to learn more about the MacCarthy family, the Kelly’s, and the climate of Ireland at the time. A nation and families stuck between the old traditions and the modern ways of the world, seeking the best path through to the other side. What propels Ben on this journey and what does he learn? Readers will want to pick up a copy of Venetia Kelly’s Traveling Show to find out. 1. Leave a comment on this post of what you would like to see in Ireland. 2. Leave a comment on my interview with Frank Delaney. 3. Blog, Facebook, Tweet, or spread the word about the giveaway. Deadline March 1, 2010, at 11:59PM EST. 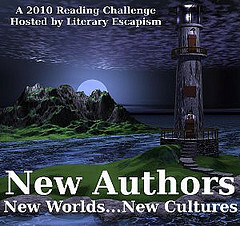 This is my 11th book for the 2010 New Authors Reading Challenge. My 1st book for the 2010 Ireland Reading Challenge. FTC Disclosure: I received a free copy of Venetia Kelly’s Traveling Show by Frank Delaney from publicist Leah Paulos and Random House. Clicking on title links or images will bring you to my Amazon Affiliate page; No purchase necessary. 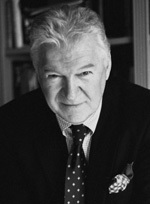 Look to your right and you will see a dashing photo of Frank Delaney taken by Jerry Bauer! He — Delaney, not Bauer — is the author of Venetia Kelly’s Traveling Show , which will hit stores Feb. 23. I’ve been reading his book and enjoying the author’s style, but since I want to do the work justice, I figured I would postpone my review until Feb. 22. Instead, I’m going to bring you a fun interview with Delaney where he talks about books, writing, and more. Without further ado, here’s the interview. Please give Frank Delaney a warm welcome. 1. Venetia Kelly’s Traveling Show takes place in the 1930s, and many of your previous novels have either dealt with or been set in Ireland during previous decades. 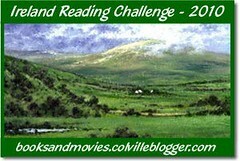 Has it been your intention to revisit Ireland in each book with a new decade? Why or why not? I wanted to write a “history” of Ireland in the 20th century, when so much happened to create the country we know today, and in which I grew up. And it’s a place and period full of rich incident, eccentric character, and arresting themes. Also, I love the idea of taking the readers into an unknown world – which was after all so familiar to me – and allowing them to stand on the sidelines and observe what’s happening in that world, sharing with them what I saw and know. 2. Venetia Kelly’s Traveling Show reminds me of the gypsy shows seen in many movies. Did you have a particular inspiration for the traveling show and is it based on an actual show you’ve seen or researched? I’ve seen so many of them! There was one I actually used to follow across the country; it was part theatrical, part medicine show, with the worst and goofiest performers you ever saw. But there were others, gifted acting troupes, who brought Shakespeare and Sophocles and Strindberg and all the great dramas to small country towns, and they live for ever in my mind. I was captivated by them. 3. Tackling the betrayal of a spouse can be difficult, especially for a child. Ben MacCarthy must take a journey to bring his father home after he runs off with the caravan. How would you say your coming-of-age novel that sets a young man out on his own differs from other novels of a similar ilk? Great question! This is what I was trying to do: I was trying to apply some of today’s experience, where children routinely observe such upheavals in their families, to an unlikely time and place – rural Ireland in the 1930’s, because I wanted to show that whenever it happens, distress is distress, and therefore a bond is created between past and present. The time-lapse, I felt, might sharpen the edge of his rite of passage. As a consequence, the book is full of deliberate mistakes (perpetrated by Ben or his father), misunderstandings and unexpected discord – as they would be in a story from today’s family experience. It’s also packed with mythological references, some hidden, some not,, because I like to do that stuff! I believe it gives a book depth and subtlety, all smuggled into a “story,” which – like all my novels – starts deliberately slowly, and then (when, as I hope, I’ve captured you) begins to go much, much faster. 4. You were born in Ireland and made a name for yourself in broadcasting. Could you describe the transition you made from being a broadcaster in Ireland to an author in America and any hardships you may have encountered? It’s been a long journey. I don”t know if I’d use the word “hardships” – but there certainly have been obstacles. In the UK I worked as a broadcaster for the BBC for many years and learned so much about one-air audiences at their excellent hands (I hope it shows in my audiobooks: I always read the recordings of my own novels). But that didn’t dim or reduce the requirement to learn the skills necessary in reaching an audience for writing, and that will always be, as for every professional writer, the “hardship” of the ongoing challenge. In fact the world is now so full of challenges for authors that I’ve actually started writing a book about the future of authorship. 5. Please share a few of your obsessions.(i.e. a love of chocolate, animals, crosswords)? Ha! Crosswords, certainly – though I do genuinely believe that the language barrier across the Atlantic makes the New York Times crossword v. difficult for me, so I download the Daily Telegraph Crossword from London instead! Chocolate – Yummmm! BUT – take note; on a significant birthday I made myself a promise that I would never let a day of my life go by without eating ice-cream. By and large I’ve kept to that. As to animals – if I could, I’d have a Sumatran elephant as a pet. And watch out (in a year or so) for a significant animal pet in the novel I’m writing at the moment. 6. When writing poetry, prose, essays, and other works do you listen to music, do you have a particular playlist for each genre you work in or does the playlist stay the same? What are the top 5 songs on that playlist? If you don’t listen to music while writing, do you have any other routines or habits? I have specific music that I use for different phases of work. Dominant of these is techno – and I have a number of Internet radio stations (some coming out of France) that I listen to. I prefer the truly insistent house stuff, I find the the drive of it very energizing. I also try to find North African music; I developed a taste for it in Greece many years ago and it fires me up. I’m looking at my lists now and – a random glance – I see Diana Krall, Manhattan Transfer, Bob Dylan, Willie Nelson, and one of my all-time favorites, Gundula Janowitz‘s’s recording of The Four Last Songs. For the ultimate kick-start on a slow day – Wagner. Bach for warming down! 7. Which books have you been reading lately, and are there any you would recommend in particular? Which books do you think should be read by more readers? Am reading Game Change , the bestseller of the 2008 election campaign; am finishing an excellent biography of John Fowles (whom I knew); re-reading (again) The Great Gatsby ; will always be dipping into Ulysses – that’s the book more people should read, because it’s so huge and rich. Just finished an old Ed McBain thriller – took not much more than an hour or two, but oh, boy! Did he know how to roll a story? To declare my interest – I’m also re-reading my wife, Diane Meier’s deliciously edgy first novel, The Season of Second Chances . (And from what I’ve seen – her second will be even better!) If there’s a new Alan Furst coming, I’ll be onto it straightaway. And Shakespeare, always Shakespeare. 8. As an author and interviewer of authors, what is the one question you would like to be asked and answered? How would you answer it? Thank you for answering my questions, Frank. We wish you luck in all you do. 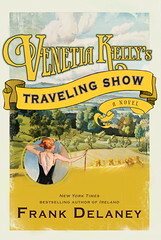 Stay tuned for my review of Venetia Kelly’s Traveling Show on Monday, Feb. 22.